They took Mikes squad car and pulled up behind the fire chief’s vehicle. There were still a few gawkers, gawking outside. The third floor windows of Henry’s office were broken out and the bricks were charred half way up the 4th floor. It looks like the firefighters were able to stop the blaze from engulfing the entire building. “It looks like the fire started in a trash can. The French guy called it in.” Sparky said, motioning for Henry and Mike to follow him. Henry saw Francis, standing across the street with the onlookers, talking to a short round man with a small notebook. They walked up to the third floor and the chief explained that the fire had been contained to the one office, but the smoke had made quite a mess of the neighboring offices, including Francis’s. The trudged down the hallway and the rancid smell of smoke and wet filled the air. The chief said, “Now be careful, and don’t touch anything, we are still investigating.” Henry looked down at the floor, the glass from his door was in a couple of pieces with a couple of letters missing, “Henry Wood Detec e Ag n y”. He stepped over the glass, careful not disturb anything, and into the office. The filing cabinets were opened and had been badly burned. The desk was mostly gone, as was his trash can. It did look like the fire must have started in the trash can and it also looked as if the offices had been given the once over, though it wasn’t turned upside down like his apartment. Henry looked around for another minute and walked out. “You ok Francis?” Henry asked. Henry, Mike and Francis talked for a while longer, and then parted company. Mike took Henry back to his car. He offered his couch to Henry, if he needed a place to stay. Henry declined, and said he would just get a room. He wanted to be alone. Henry assured Mike that the Journal was safe and that they could get it tomorrow. Mike promised Henry he wouldn’t mention the journal to anyone, though he was a bit offended, when Mike suggested there was a mole in the police department. “Not at all, it smells wonderful. I will try one in a minute.” He said, heading down to the basement. He went straight to the closet, hoping he might find something new. He opened the door and there was a little grey box, with the words Shop Fox on it. 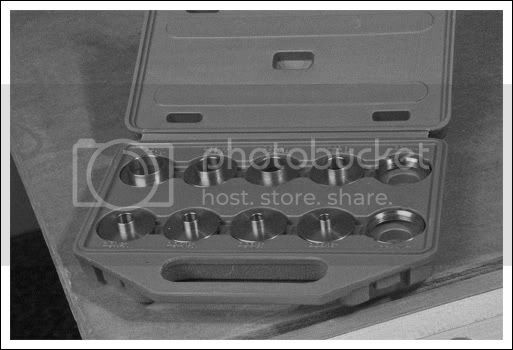 He opened it and there were 10 small brass bits of different sizes, two of them were marked ‘locknut’ while the other’s had different dimensions on them. He wasn’t sure exactly what they were for, but he guessed they had something to do with his router. He put the little box with his router and went upstairs. He snuck into the bathroom to clean up a bit before he saw Luna. He didn’t want her to fuss about his cuts and bruises. Despite his assurances that he was fine, she fussed anyway. He sat, eating a cookie, as she entered ‘mothering’ mode. He replayed the day in his mind and decided that the best thing he could do at that moment, was to eat another cookie. to see if they were really gold . Sras…that is a good idea! I hadn’t thought about that. You know, I bought a set of those router thingies too. That’s when I found out the Triton router doesn’t come with a “standard” opening. I take them out every once in a while and wonder what I was going to do with them before I decide not to sell them on Craig’s List and put them back away. I hope you enjoy yours too. I hope Henry doesn’t slip too deep into the black and white world of despair over his loss. Hot cookies beat bench cookies any day in my book. I have read several project articles that required the templates. I think they are quite handy to have, and I was considering buying them before I had decided to build my own router table. I will try to make sure I do a project with them, after the router table. Just for you. You might keep in mind Brian that you can also use these template guides with the router table. I’m thinking of box joint, dovetail and spline joints. They guide and provide stops for the jigs at the same time so that you needn’t have a separate guide and stops clamped to your router table. Its becoming obvious that our hero has had a successful business how come no associates even part time. If hes going to do all the thinking and questioning seems like he must have some usable associates to start doing the multiable. Sort of like Nero Wolfes day help. Sam Spade had a partner, of course, he died before we got to meet him, but your point is a good one. Brian, you must have read the books because we did get to meet Miles Archer, Spade’s partner, in the Maltese Falcon. He was shot dead too. I must be getting old. I didn’t remember that we got to meet him, oh well, I stand corrected.